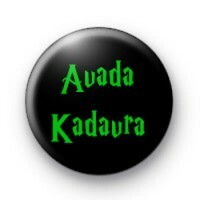 Avada Kadavra Curse Button Badge. This is a death curse and in the wizard world is an unforgivable curse. Harry Potter book fans will love this harry potter badge.